First off is an adorable house made from (only) the supplies in THIS 3D House Ornament Kit by Teri Calia. It has a little accordion book with the entire poem of "The Night Before Christmas" (tied with a bow so the house could even be an ornament — just add a ribbon at the top). The poem is already laid out to fit the width of the 3D house, from the The Night Before Christmas Collage Sheet (also included in the kit). Bunches of covers of vintage Christmas books (mostly "The Night Before Christmas") in a mix of "normal" rectangular shapes but also 5 laid out in the house shape to match the house template. 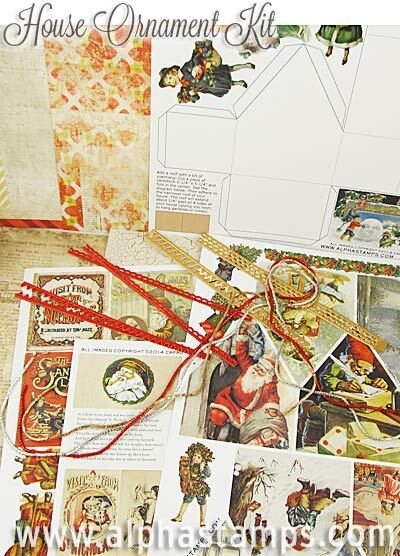 Beside coordinating with the 3D House Ornament and House Ornament Scenes Collage Sheets, you can use these book covers alone (you could use paper tape to hinge the house-shaped ones together into an accordion book, for example). Tons more house-shaped scenes (from Santa to children to a snowy scene with Santa and his reindeer flying through the night sky — that teri used behind her accordion book). And all those new collage sheets are On Sale, too! 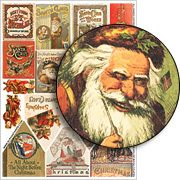 ALL Christmas Collage Sheets are on sale! 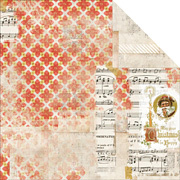 AND there are 4 full size (12" x 12") scrapbook papers in the kit (in a neutral palette — at least on one side — so you can keep a vintage sepia palette, or go wild and stain/mist/glitter the papers (or your house) into vibrant hues. Finishing this first kit is a set of 4 different narrow Dresden borders, and a package of crinkle wire in silver, red and gold. Here's a list of all the items in the kit that are available to buy separately (until sold out). See the "We Also Recommend" section, below, for links/pics. All options are postage-paid! USA only. And remember, here's a link to everything in this month's kit that is also available to buy separately. 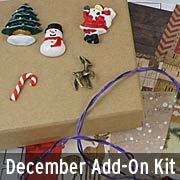 More coordinating goodies are listed on the blog post announcing this kit.